Well said. God rest him. Hear hear, well said. Words of wisdom as usual. To many want to knock people from our wee country that make it in the world,we should be backing them to the hilt and remembering the good times they gave us. 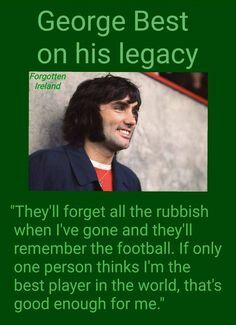 I am fortunate enough and old enough to have seen George play a few times when he was in his prime in the late sixties and I would say that the comments made by misssmyth1 were a fair reflection of his chaotic life. George had an illness. I don't think for one second he was a bad man. "The scout who had spotted his talent at the age of 15 sent a telegram to manager Matt Busby which read..."
"I think I've found you a genius." 43 minute documentary about him,... towards the end of his life,... which is mainly interviews with him,... and he speaks very honestly and openly,... it's very good, if that's the right word. I spent my money on fast Cars Women and Booze and squandered the rest ... what a wit.. He truly was a genius on the pitch and for all of his faults not many people had a bad word to say about him. We all make errors while going through life but we live life our way. 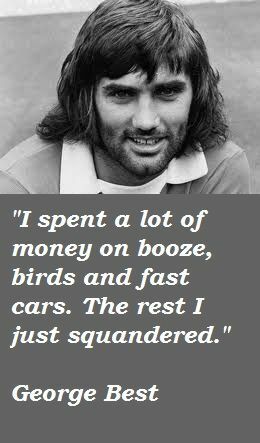 George Best is a Legend of our Time. Whatever his personal problems were-can never take that away from him or us. Its very easy to bring down people like George-but to my mind it says more about those who do so than George. Absolutely,... and that says everything about him, and a lot about them. Hear hear, we should be proud of those from ' our wee country', who have done well. No George had an addiction, not an illness. Although I have not lived in NI since 1970 I am always so happy to hear positive news and praise for anyone and anything from there instead of the sadly usual negativity over many years . Yes, that's exactly what he had. "ADDICTION MEDICINE: CLOSING THE GAP BETWEEN SCIENCE AND PRACTICE."